Remarks:BML-275 is a cell-permeable pyrazolopyrimidine compound shown to be an AMP-activated protein kinase (AMPK) and Fatty Acid Synthase inhibitor. Phosphorylation of AMPK occurs in vivo when energy sources are low and in-turn suppresses expression of SREBP-1. SREBP-1 is a key lipogenic transcription factor, and its suppression allows glucose production by hepatocytes. In mouse studies it has been reported that BML-275 rapidly reduces the level of the phosphorylated AMPK α subunit in the hypothalamus, in an ATP-competitive manner, therefore altering energy perception and affecting the physiological energy sensor of the body. Over-activation of AMPK has also been found to be deleterious in ischemic stroke conditions and inhibition of AMPK by BML-275 may provide a small level of neuroprotection. Additional research on zebrafish has shown that BML-275 also inhibits bone morphogenetic protein signals required for iron metabolism and embryogenesis. 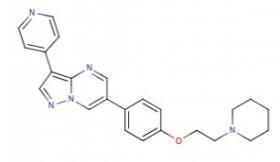 BML-275 is an inhibitor of ACTR-I, BMPR-IA and BMPR-IB.